This is an uncommon complication of monozygous twinning in which there is fusion of the twins. 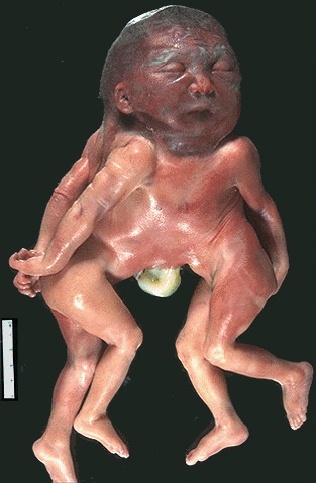 The popular term is "siamese" twins. The scientific term applicable in the case shown here involving two stillborns is craniothoracopagus, or twins joined at the head (cranio) and chest (thoraco). There is only one brain, and the hearts and gastrointestinal tracts are fused as well. The location and amount of fusion can vary. Separation is possible with simple fusion of superficial structures.